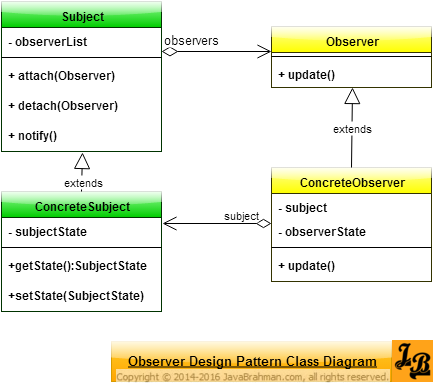 This article explains Observer design pattern in java with UML class diagram. It then takes an example scenario in java and explains it with class diagram and code. Introduction: Observer Design Pattern is a behavioral design pattern among the Gang Of Four(GOF) Design PatternsArticle on GOF Patterns & their types. Being a behavioral design pattern, the Observer pattern deals with how objects of the designed system interact with each other. Observer Design Pattern is used when there are multiple subscribers observing updates from a publisher. The publisher, known as Subject, publishes its change of state to its subscribers. Subscribers, known as Observers, receive these changes and update themselves accordingly. Change of an object requires changes to multiple others: When there is an observed object(a.k.a the Subject), then there should be a mechanism to notify its changes to multiple of its observer components which have evinced interest in listening to these changes without the exact quantity of observers being known at design time. Subject is the one being observed. It has attach() & detach() methods to add or remove observers respectively. It uses notify() method to publish its changes to observers\subscribers. Observer objects register\attach themselves to the Subject they want to listen to for updates. ConcreteObserver instances are actual Observer objects which treat the notifications they receive from the Subject in their own individual ways. ConcreteSubject is the actual Subject object whose state change is notified to multiple observers. Java has an inbuilt Observer pattern implementation using the class java.util.Observable (represents Subject) and the interface java.util.Observer(represents an Observer). Concrete Observers in Java need to implement the Observer interface, whereas concrete Subject needs to extend Observable to provide its own notification logic. Lets now look at an example implementation of observer design pattern in Java using Observer and Observable. Publisher is the Subject. It extends java.util.Observable. Subscriber1 & Subscriber2 are the Observers. They implement java.util.Observer. Client first initiates Publisher. It then adds one instance each of Subscriber1 & Subscriber2 to Publisher’s list of Observers. Client then invokes method changeStateTo() with new state value as “assigned”. Internally Publisher then initiates notifyObservers() with this new state value. Before notifying Publisher calls setStateChanged() which is a requirement of the java’s observer pattern implementation. update() methods of Subscriber1 and Subscriber 2 are called internally by the notifyObservers() method and the new state value received by both in the parameter arg is printed. In the above tutorial we understood what is Observer design pattern and the main scenarios in which this pattern is applicable. We then looked at the UML class diagram for Observer Design Pattern & its explanation, a Java Use Case implementing Observer pattern with its class diagram and code for the classes shown in the class diagram, followed by explanation of both the class diagram & code. This concludes the tutorial on Observer design pattern.